There were a number of documents that were loose in the bible. Clearly family records the owner of the bible was proud of and wanted to keep. The mother of Fritz Rimmler was Katharina Susann Schweigart (1864-1908). She is the daughter of Joh. Georg Christian Schweikart (1828-1912) and Anna Elizabeth Reinhard (1830- 1908). (Family tradition has it that Anna Elizabeth died of heartbreak after her daughter Katharina Suzann died.) Anna Elizabeth was Fritz Rimmler's maternal grandmother. The bible, then, which was printed around 1764, was likely from the family of Johan Sebastian Reinhard who married Anna Katharina Gerlach. However I don’t have dates of birth, death, or marriage for Johan and Anna Katharina. Presumably they were married sometime before 1816, and we could guess that Johan was born sometime about 1786 and 1796. Thus it is likely the bible, which was printed in 1764, came into the family sometime before Johan was born. Grade School diploma of Anna Elizabeth Reinhard, May 1843. She would have been 13 years old. Here is a translation of her diploma and a jpg of the original document. 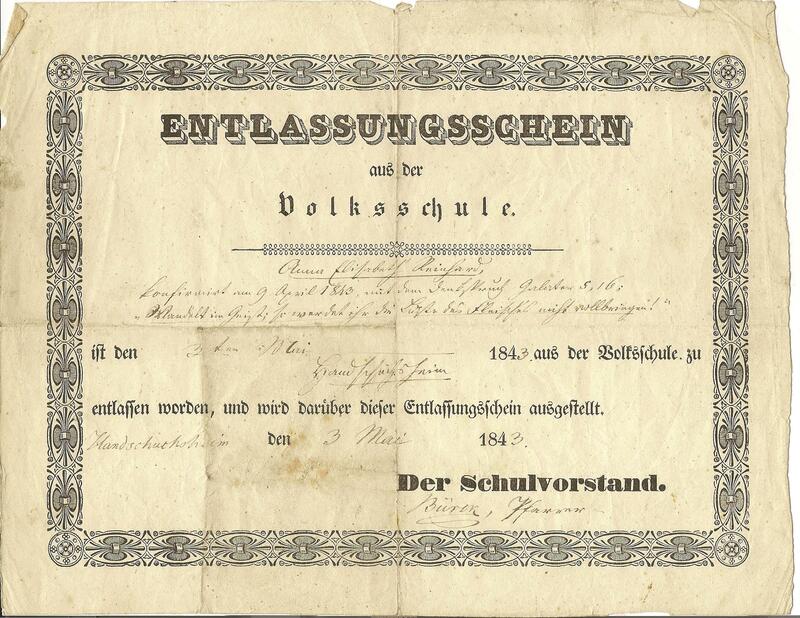 The Grade School Diploma of Eberhard from 1841, similar to Anna Elizabeth’s. 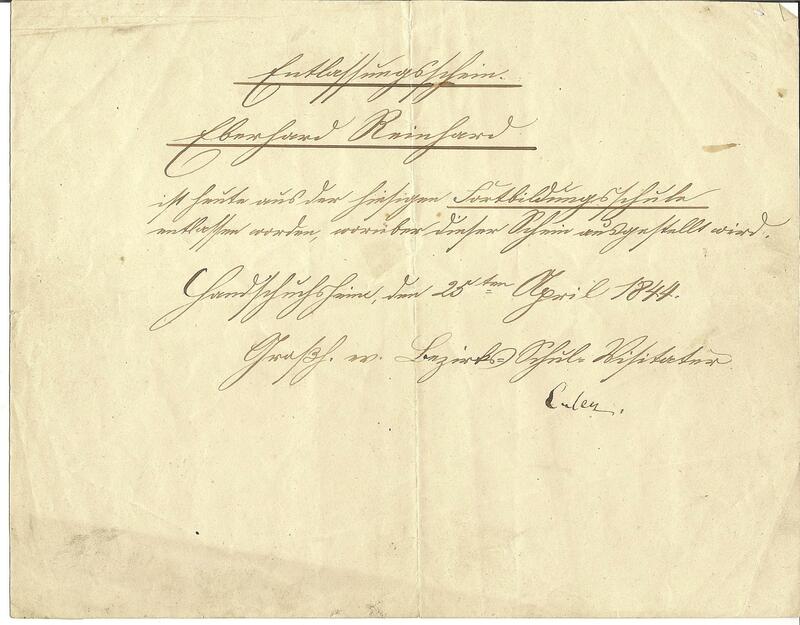 Also, a handwritten Certificate of Discharge of Eberhard, April 25, 1844. Here is a translation of his discharge Word pdf and the original. I am not sure if this is a diploma. He would have been 17 years old when he received this. Grade school diploma, probably of Eva Katerina. 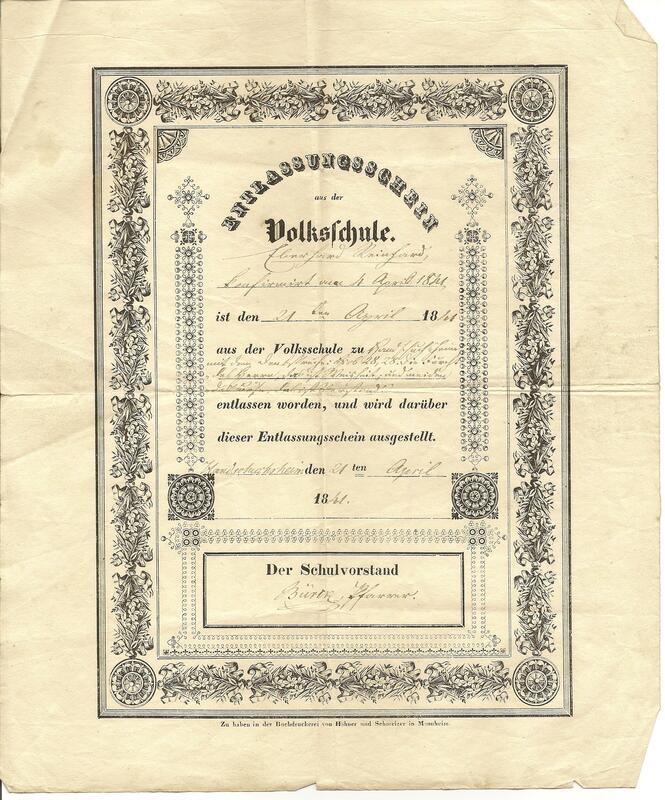 Confirmation Certificate of Michael in 1840. Note some things: It gives his name as “Michael” rather than “Johan Michael.” He would have been confirmed at the age of 14. Here is another list of children written in the bible. From the translation( Word pdf ,) page 1, it has the same names of the children, including now Eva Katarina’s birthday as 1832. Here is the original. However after Eva, it goes into grandchildren, sons born in 1842, 1845, and 1848. These must have been children of Sebastian or Anna Marie, who would have been 26 or 20, rather than Michael, would have been 16. Of course the grandchildren may have been to different parents. Eva, 1857; Daniel, 1858; Susanna, 1864; and Margarete, 1873. Susanna’s date of birth is given as 1-25-1864. 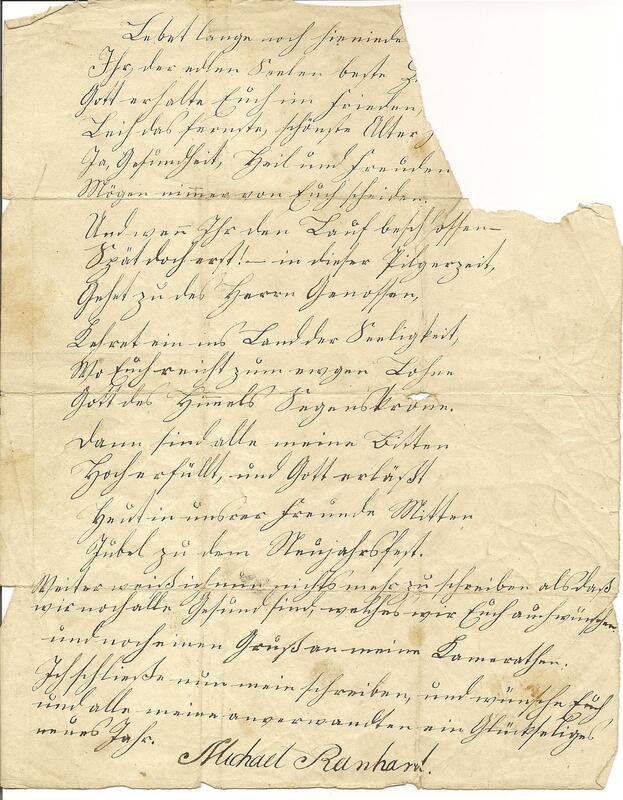 We have other records that give the date of birth of Katharina Susann Schweikart as 28 January 1864 and the spelling of “Susann” alternatively “Susanne.” She was the daughter of Anna Elizabeth Reinhard. This fits then, that the different writer was Anna Elizabeth Reinhard, and those were her children, including Susann(e), indicating she had possession of the bible in those years, and thus the bible could have gone to Katharina Susann(e). Thus, the handwriting in the bible, on that page, is likely that of my great, great, grandmother. 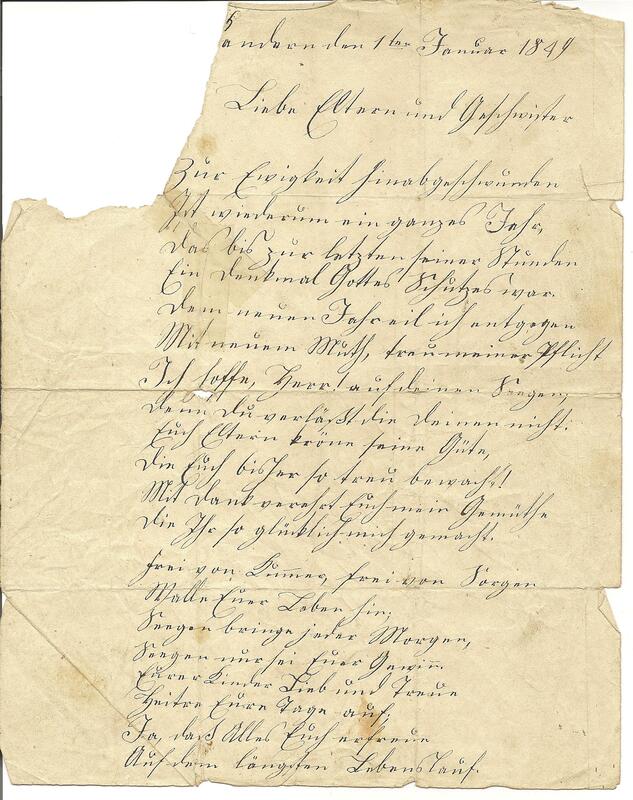 The last document, Michael’s letter, is a New Years letter in the form of a poem, written my Michael Reinhard on January 1st, 1849. It indicates a deep religious feeling and is probably an original poem. Here is the translation page 1 pdf and page 2,pdf and the original page 1 and page 2.